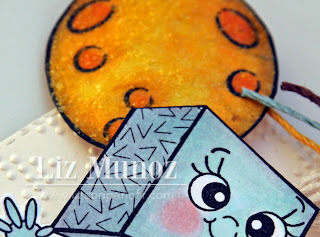 Liz's Paper Loft: Peachy Keen Guest Designer ~ You are outta this world! 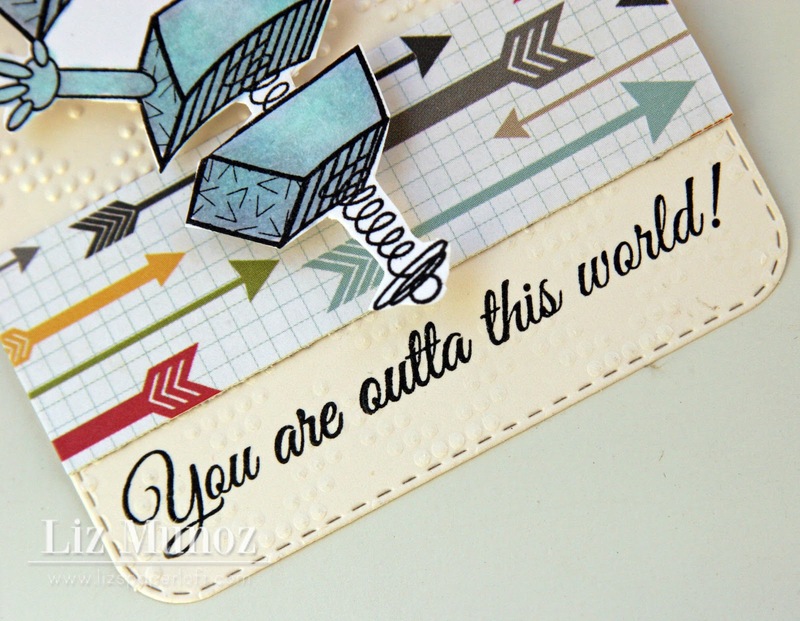 Peachy Keen Guest Designer ~ You are outta this world! Hi Everyone, today is my last post as Peachy Keen's May Guest Designer! I just can't believe how fast this month has gone by! 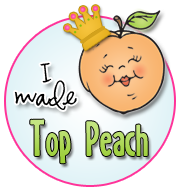 I had so much fun creating and "peachyfying" all of my projects! 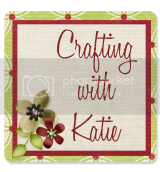 I want to thank Peachy Keen for asking me to be a guest designer and making me feel so welcome! For my last project I wanted to share a layered tag. 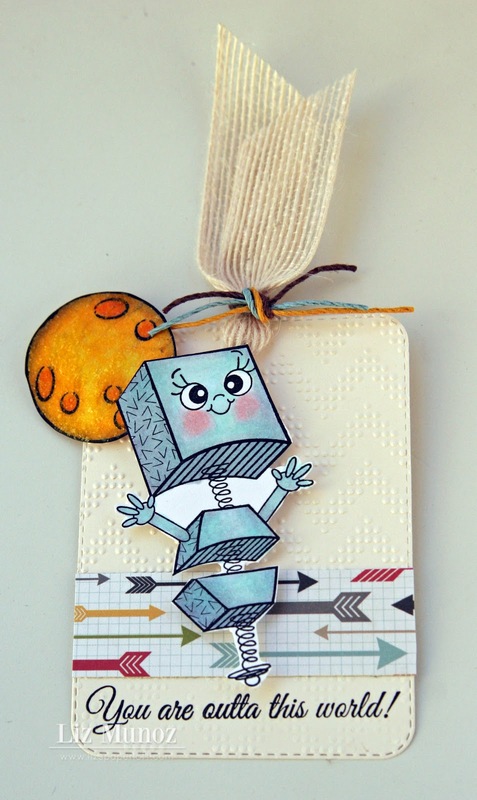 Tags can be so versatile since they can stand alone or be added to a card base. I used PKSC 14 February and colored them with my copic markers. For the moon, I used copic markers then added some Distress Stickles to create dimension and slight sparkle. 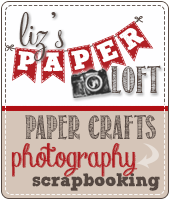 This month is my 1st Anniversary for Liz's Paper Loft Boutique!!! code HAPPY1ST to receive 25% off!!!! Lastly I'm giving away a Teresa Collins Summer Stories 12x12 paper kit! Leave a comment here to be included in the drawing at the end of the month! So darn cute...love your tag!! How super adorable is this Liz!!! 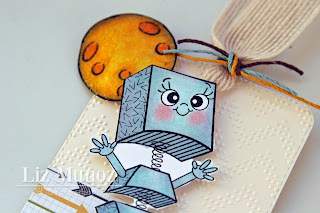 Love that robot and your coloring is awesome!!! 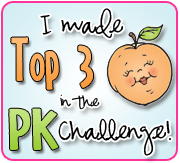 Thanks for all the fun PK inspiration this month!! Eek! This is adorable! Love that little robot!!! so cute Liz! 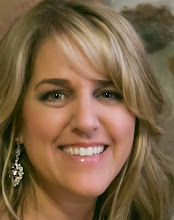 I loved my time as Guest Designer for PKS! wow, this is so adorable and I love the way you colored the image! 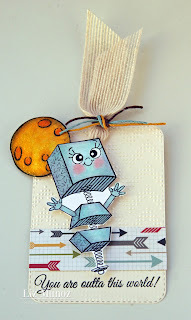 This little guy is so cute and love those arrows along the bottom with the sentiment! This is sooo cute! !I love tags and this one is just adorable!! 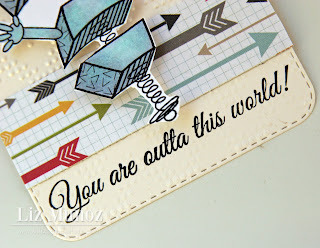 I love this card....the arrows the Coptic coloring you did...and the chevron background....love love love it....you are fabulous!! Thrifty Thursday ~ Wish Big! 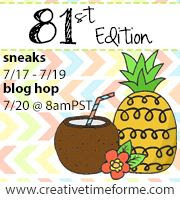 My Creative Time Birthday Blog hop & Sale! MCT 3D Wednesday ~ Framed!